Omni-Channel Customer Experience, put simply, is the ability of a customer to access your products, services, and departments throughout ANY (“omni” meaning “of all things”) channel they may come across – with a seamless transition from channel to channel. It’s an overwhelming concept at first. How are we going to respond quick enough and manage the ever-increasing volume of requests? And then, how are we supposed to seamlessly integrate all of these channels together? While there are countless ways to approach these issues – most of them dealing with reams of consumer data – we’ve come up with five of the best practices needed to execute a holistic and dynamic customer experience. It isn’t up for debate anymore – mobile usage has far surpassed desktop browsing. What’s even more interesting is that most of that mobile usage is done via apps. According to a study conducted by eMarketer, 3.23 hours a day are spent on mobile apps, while only 50 minutes of mobile time is done through a web browser. There are currently 2.32 billion smartphone users in the world – another indication that mobile is King. 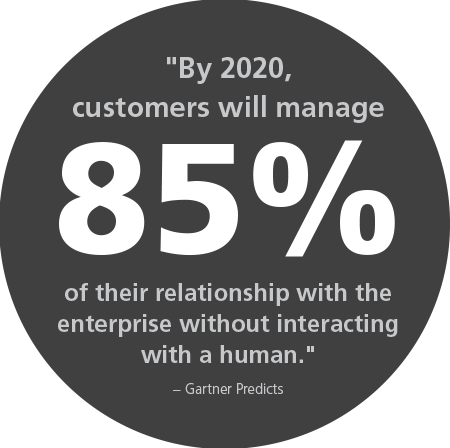 What does this all mean for your Customer Experience (CX)? For starters, your web site better be mobile-friendly. 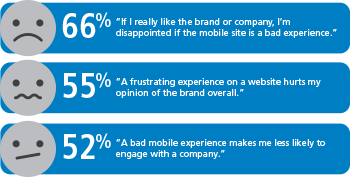 52% of customers are likely to never visit your site again as a result of a bad mobile experience. Everything about your business should translate smoothly across mobile channels; A mobile-first initiative may even be in your best interest. Self-servicing is quicker, more empowering for customers and leaves less room for error. Take Chase for example. By switching to self-serviced kiosks, they have reduced line-time, transaction errors, and left customers with the option to access funds and complete transactions that otherwise wouldn’t be possible without a bank teller. Ironically enough, self-servicing even allows for a more personable experience. Most airlines have made the switch over to self-serviced kiosks after determining that a “one-size-fits-all” approach doesn’t work best. Now, customers can skip steps that they’ve already completed, opt out of certain options and generally have greater control in their service standards. It’s no wonder that most businesses are making the long-awaited switch to self-servicing. Just make sure you don’t get left in the dust. Solving a customer service issue on social media costs nearly 1/6th as much, compared to a call center. Consequently, 90% of businesses are estimated to use social media for customer service by 2020. 60% of customers who complain on social media expect a response within the hour. 71% of consumers who experience fast customer care are likely to recommend the brand to others. 88% of consumers are less likely to buy from companies that leave complaints on social media unanswered. 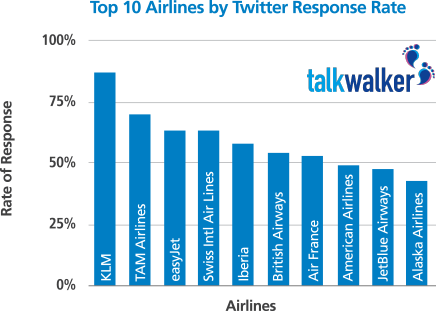 KLM replies to 90% of its replies and mentions on twitter. The result? A loyal, and evangelistic consumer following. Another study conducted via twitter found that airline customers would be willing to pay $2.33 more for the same or enhanced service if a social response is provided in 67 minutes or less. Even more incredible, customers would be willing to pay an astounding $19.83 more if a response is provided within just six minutes. The takeaway? Make sure your social accounts are actively monitored and deftly handled in the event of customer complaints. You’ll reap far more than just a single happy customer. A Chatbot is an automated conversational agent who conducts basic operations via speech and text commands. The main allure for using a Chatbot is the sheer size in audience handling capabilities. They can provide content, place purchase orders or simply answer customer questions in an automated chat system. Simply, Chatbots and RPA’s (robotic process automation) streamline all the interactions between customers and services. They’re a great alternative for teams that don’t have the resources to station a live person to a chat system, and an even better alternative for teams that need to handle thousands of queries at a time. Another fantastic quality of a Chatbot is the ability to instantly capture data. By using sentiment analysis, a Chatbot can conduct split tests based on the conversations had with a consumer and the future actions that consumer takes. The possibilities for split testing like this are endless! Besides, consumers are more than comfortable engaging through the types of messaging portals that Chatbots use. As a result, there’s no lag in consumer adaption. Just take a look at these figures from Business Insider: 3.1 billion users actively talk through messaging apps, and 6 out of the top 10 global apps are messaging apps! That’s a consumer base you’d do well to utilize. It isn’t entirely surprising, either. As markets get flooded by technological advances like Chatbots, a human touch will likely become more sought after and serve as an important differentiator for this purchasing segment. 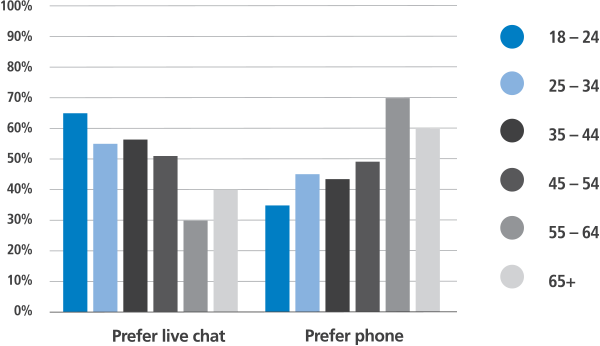 Even now, 63% of consumers are more likely to revisit a site that offers live chat. After all, there are still certain queries that Chatbots may come across that only a human would understand how to answer. If you can afford the resources, a live chat person is an ideal personal touch to your brand and an added satisfaction-factor for your consumers. Having a consistently great Customer Experience is a difficult task to manage and integrating an omni-channel strategy can seem very daunting at the get-go. But, after the technical and analytical aspects are managed, an omni-channel approach to Customer Experience is by far the most rewarding. Using these best practices will ultimately set you off on the right path to a 5-star customer service rating in no time. "In today’s connected world, it’s not enoughto simply provide an omni-channel experience. Consumer’s expect a holistic experience that bridges your brand story across all channels. Successful, visionary companies are committed to creating a dynamic omni-channel Customer Experience that engages the customer at every point of their journey. How you manage your technical and analytical resources will strongly influence your ability to deliver a synergistic experience that inspires your customers."